Dublin residents will let their voices be heard at Town Meeting in mid March. The Warrant for 2014 includes 28 articles. Seven articles pertain to zoning ordinance changes /additions and will be voted on by ballot on Tuesday, March 11, at Town Hall. 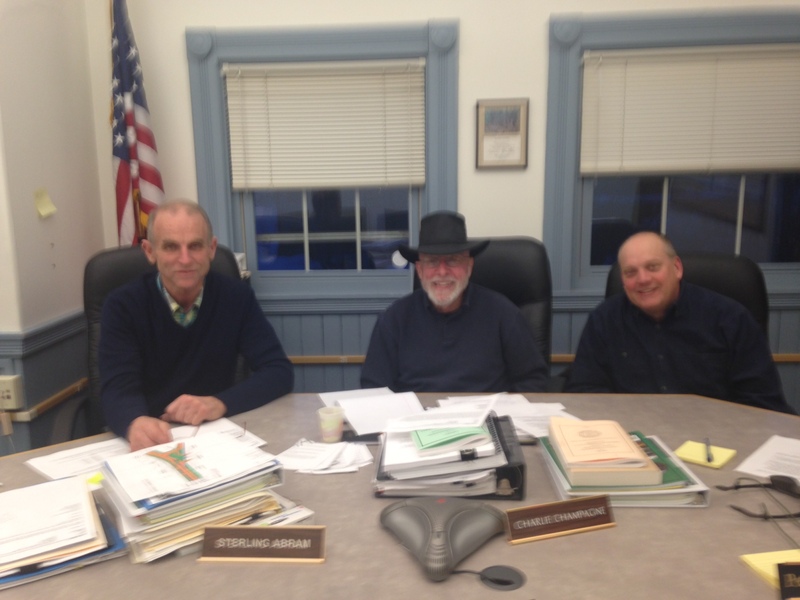 The remaining articles will be voted on at Town Meeting Saturday, March 15, at Dublin Consolidated School. The Dublin Women’s Club invites all interested citizens to attend the annual pre-town meeting forum on Tuesday, March 4, 2014 (snow date is Wednesday, March 5th) at 7 pm in the downstairs meeting room of the Town Hall. Selectmen, Budget Committee representatives and department heads will be available to answer questions on the 2014 budget and warrant. Refreshments and a short Women’s Club meeting will also be held. Each year this event provides a valuable opportunity for townspeople to become acquainted with the issues before Town Meeting. Meet your Candidates and discuss issues with them on Saturday morning, March 8th at 10 am. Feel like you are missing out on the Dublin Public Library’s Wednesday morning story time? Well, maybe you are free on Saturday mornings. Beginning March 1 from 10:30-11:30, we will read a book and have our craft table ready for little hands and big helpers. Stop in and enjoy a cup of coffee while your children listen to a story and then make a fun craft to take home. Think of this as a “fun morning” and check out a few books and a movie for the week. If you enjoy reminiscing about “back in the day,” you will love Reminisce, the new magazine that has been given to the library. March will find promises of spring at the library – even though the ground is still covered with snow. On display will be books with bright covers on such subjects as flowers and spring-cleaning, as well as stories of Ireland, and books on hiking, golf and other outdoor activities. If you haven’t been to story time at the Dublin Public Library recently, stop by on Wednesday mornings at 9:30. We encourage children and parents to crawl out of hibernation and enjoy the fun activities we have planned for March. Songs and books always make the children feel better and who doesn’t enjoy watching their child create a special craft to take home? On March 5, the theme is “sunshine makes me happy,” and we will read the book All Around Me I See and look at nature though camouflage. We will be loving Ireland on March 12 as we introduce the children to St. Patrick and the green grass of a distant country. On March 19, we explore Spring Arrives Tomorrow! There will definitely be spring at the library as we make wonderful paper flowers. On March 26, we’ll Hip Hop with a Harp, make a harp and dance around the library. Refreshments are served. The Dublin Community Church will hold its Annual St. Patrick’s Day Boiled Dinner in the church vestry on Saturday, March 15, from 5:30 to 7 pm. Good food, good fellowship, and good music. Please come and bring your friends. • Add a definition of the term “Commercial Use” to the Ordinance, to wit: A business use or activity at a scale greater than a home business involving retail or wholesale marketing of goods or services. This was in response to a request from the Selectmen to define the term so they could better enforce violations involving commercial uses. • Allow, by special exception from the ZBA, larger accessory living units relative to the size of the principal unit. The ordinance currently allows an accessory living unit to be up to 25% of the finished living area of the primary living unit; the change would allow it be up to 50%, measured after separation. The Board felt the present limitation was unreasonable and that expanding opportunities for accessory units could allow better use of existing housing stock, help owners of larger homes (including older residents) meet expenses, and help Dublin meet its obligation under state law to provide affordable housing. This potential increase in the relative size of accessory living units is subject to special exception approval by the ZBA; if there is good evidence that the increase will have adverse effects on neighboring properties, the special exception can be denied. • Establish that membrane enclosures must meet setback requirements, and that membrane enclosures of 1,000 square feet or greater shall be considered structures. • Increase the allowed fence height from five feet to six feet and make other minor changes regarding fences. The rules currently allow up to five feet, and to six feet only with a special exception from the ZBA. The Board felt this was unnecessarily restrictive and that it wasn’t likely that a six-foot fence would have considerably greater impact on neighboring property than a five-foot fence. They also considered the fact that pre-constructed fencing generally comes in six-foot heights. • Allow drive-through windows in the Neighborhood Commercial District and by special exception in the Village or Rural Districts. The Board has heard differing opinions from a number of citizens on this issue. Some feel that this would benefit older people, handicapped people, people with small children, etc., and would have no major adverse impact on the character of Dublin. Others felt it would destroy the character of Dublin. The Board came to the consensus that the townspeople, rather than the Board, should decide the issue, and that it would be appropriate to place the questions on the ballot for the townspeople to vote on. • Allow gas stations to have up to three gasoline pumps (instead of the two currently allowed) and allow, by special exception, gas stations to have pumps that dispense both gasoline and diesel fuels, which is currently not allowed. The Board felt that this was called for due to the current level of traffic on Rte. 101 and the frequent lines at the gas pumps of the town’s only gas station. Tabled: After consideration of input at a public hearing on the proposed amendments, a proposed reduction of the size of the wetlands buffer from 100′ to 50′ from the edge of water bodies or wetlands was tabled for further study, and a change to the special exception requirements regarding accessory living units was dropped. The exact wording of the proposed amendments is on file at the Town Office. March 10th by 5 pm: Deadline to return absentee ballots in person to the Town Clerk’s office. (Mailed absentee ballots must be received by Election Day.) The Town Clerk/Tax Collector’s office will be open from 9 am to 5 pm only on Monday, March 10th. March 11th from 8 am to 7 pm: Town Election Day. Voting is on the top floor of Town Hall. March 15th at 9 am: Town Meeting at Dublin Consolidated School. Park at Yankee Publishing’s lot and take shuttle (from 8:30 on) provided down to DCS. The State of NH (RSA 674.2) requires that every town have a Master Plan. This ensures “legal standing” for all ordinances as long as they “result in preserving and enhancing the unique quality of life and culture of New Hampshire” as set forth in the Master Plan. If zoning amendments are being proposed that are at odds with the master plan, something needs to be done. Either the master plan needs to be updated to reflect new circumstances, or the zoning amendments should be considered inconsistent with the goals of the master plan. This is the situation we are in: The Article 6 proposal is at odds with Dublin’s Master Plan as well as with our Land Use Regulations that specifically deny “drive-through” restaurants. If passed, Article 6 may not have legal standing. The Planning Board is required to update the 2006 Master Plan in the next few years. If people think drive-through facilities would be good for Dublin, they should come to the public meetings that will be part of the process. Ed Germain is a former Planning Board Chairman and a former Selectman. Dublin voters may remember that the New Hampshire Voter ID Law (RSA 659:13) went into effect in 2012. The legislature made some changes to this law effective July 24, 2013, and supplied an explanatory document to help educate the public about the law’s requirements. This document is available at the Dublin Town Clerk/Tax Collector’s office, and you can also view it on the NH Secretary of State’s website, at www.sos.nh.gov by clicking the link on the Home page that says Voter ID Explanatory Document. The document will also be posted at the Town Election on March 11, 2014. We hope to see you there! Dublin voters should be aware that the proposed zoning change to allow drive-through restaurants is not limited to Carr’s Store (T-Bird Citgo). If passed, it would allow drive-through restaurants in 70% of Dublin including the entire lengths of state highways Route 101 and 137 (except next to Dublin Lake). This is because the zoning amendment allows, by special exception, building these in the entire rural district, which is the majority of town. The Dublin Master Plan, last revised by town residents in 2007 and then adopted by the Planning Board, stresses the importance of preserving Dublin’s rural, scenic beauty and strengthening the Village District with locally owned businesses serving Dublin residents. Currently there are no drive-through restaurants from Wilton to Brattleboro on Routes 101 and 9. Please carefully consider your vote on this proposed zoning amendment. This vote takes place by ballot on March 11th, 2014 at the Town Hall. After months of Board deliberations, it’s time for the voters to weigh in. On February 6th the deliberative assembly approved the budget as proposed. The total proposed operational spending for 2014-2015 is just slightly higher than last year’s budget, only 0.8% higher. Of course, given the size of the total budget, that represents $345,209 more spending. The administration deserves credit for holding steady or reducing spending in about two-thirds of the budgetary line items, mainly in maintenance and supplies. Increases were primarily in salaries, transportation, equipment, and purchased services. Salary (including benefits) represents close to 75% of the total operating budget, and despite savings in benefits this year and a small drop in total teacher population, proposed spending in this area is up $133,140. Transportation is always a challenge in a district our size, and costs in this area are budgeted to increase 6.4%. The budget for new and replacement equipment represents the largest percent increase. The primary driver is a proposed program to upgrade and expand the district’s information technology, including the purchase of new Chromebooks and iPads for middle and high school students. The technology upgrade in the proposed budget amounts to $249,375. You, the voter, now need to decide whether to support this budget; if the budget fails, the district will operate under the default budget. That default budget is $770,961 less than the proposed budget. The difference is $168,062 in salary spending earmarked for curriculum development, the money for the technology upgrade, the $40,000 for the new summer camp I wrote about a few months ago (January 2014 Advocate, p. 7), and money for various maintenance and equipment upgrades. These numbers (and many more!) can be found in the Annual Report. Finally, you will also be asked to decide on several additional spending items offered as warrant articles including money for a new tractor, resurfacing the high school track and parking lot upgrades at SMS and ConVal. The parking lot saga has been covered here and elsewhere. The other articles are fairly self-explanatory. Election Day is March 11th. Please get out and vote! Fiona Tibbetts is Dublin’s representative to the ConVal School Board. February was a short but busy month for us; the last week of it is our vacation week, and we had a couple of snow days in there, but there was lots of activity nonetheless. Our building and playground were used for WinterFest on 2/8, the Dublin School brought a circus to town on 2/14, and the Dublin Police Department arrived to run an emergency training session on 2/15. All the students in grades 2-5 completed a pilot program on opinion writing using a set of writing strategies that teachers have recently been trained in. Our results were excellent, as the children showed great improvement in organizing their thoughts and supporting their opinions with examples and explanations. February also brought the end of our annual ski program at Crotched Mountain, organized and supervised by Dr. Lara Scheinblum. 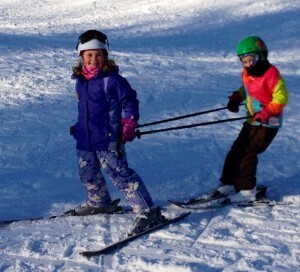 A couple of our skiers having fun on a ski day. Unfortunately, due to extreme cold and a snow day, the program was cut short by one week, but our students learned a lot and improved their skills tremendously. Our PTO is sponsoring an evening of Zumba on March 7 from 5:30 to 7:30 pm. The fee of $5 goes to support the PTO. Come and join in the fun! Children are welcome. You might also see notices about the DCS-PTO selling tickets for the Manchester Monarchs game on April 12. This is a neat way to raise some money for our school, while enjoying some special events for the kids at the Monarchs game. Plus, our wonderful PTO will be selling baked goods at Town Meeting on March 15. We’ll be sending home report cards for the second trimester this month, and teachers have two professional development days on 3/20 and 3/21. We will be continuing our work on curriculum mapping, working towards a guaranteed, consistent curriculum for grades K-12 that is aligned with Common Core State Standards. Though the NECAP state-testing program is ending, next spring will bring the new tests on the Common Core, called Smarter Balanced. We are gradually getting acquainted with these tests too. Finally, here’s a sneak preview: the DCS annual Talent Show is April 4, and this year the show will also be the kick-off for our Read-a-thon. Stay tuned! May Clark is Teaching Principal at DCS. You may contact her at 563-8332 or mclark@nullconval.edu. On Saturday, February 15th, many Dublin Community Preschoolers and their families gathered together for some winter fun. The event was hosted by Judy and Alan Edelkind of Dublin, whose four-year-old grandson currently attends DCP. 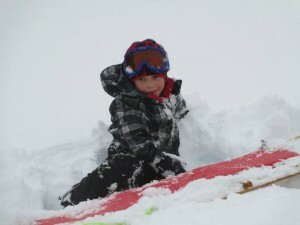 Quinn Boyd on sledding day at his grandparents’ house. The depths of snow covering their immense field reached the tops of many little legs but the trek to the top proved worthwhile for the long ride down. We caught a few snowflakes on our tongues, laughed a lot and enjoyed the fresh air and time together outside the classroom. DCP accepts ongoing enrollment for preschool as well as before- and after-school care. Registration for fall enrollment will be open to the community at the end of March. Please contact us at 563-8508 or check for updates at www.dublinpreschool.org. Cathy Carabello is the director/lead teacher of the Dublin Community Preschool. Dublin Christian Academy is hosting a school-wide Open House on Friday, March 7, from 6 to 8 pm. Each of the elementary classes will feature special displays in their rooms. Mr. Setzler’s 5th and 6th graders will be presenting science fair projects; the 3rd and 4th graders will be doing state reports and missionary biographies in Mrs. Fletcher’s room; and Mrs. Radford will be “clowning around” with her students in 1st and 2nd! We will also have exhibits highlighting many high school activities including art, physics, TARC, Winter Bible Conference and more. The classroom building will be open to visitors, and tours of the campus will be available. Throughout the evening, several award-winning music and drama selections will be presented by both junior high and high school students. The spring Open House is also the kick-off for DCA’s yearly fundraising auction. The silent portion of the auction will take place during this event, and many items will be available for you to view and bid on. In addition, the application fee will be waived for any new student who applies for the 2014-2015 school year during Open House on March 7. So spread the word, come and join us, and bring some friends! Call 563-8505 with any questions. Eric Moody is Director of Operations at Dublin Christian Academy. The Kiwanis Club of Peterborough, a regional service club that raises funds for children’s causes and scholarships, is hosting a membership drive luncheon for prospective members Wednesday, March 5, from noon to 1:00 pm at the Monadnock Country Club, 49 High Street, Peterborough. The luncheon will introduce prospects to the club, the format of weekly lunchtime meetings, and the friendship and conviviality to be found at Kiwanis meetings. Following lunch, trivia, and the joke of the day, the meeting’s guest speaker, Jim Grant, will talk about “Grit, Mindset, and Determination.” Grant will explore why some people persevere during setbacks and disappointments and will offer “grit” tips and strategies. Dublin residents are warmly invited to consider joining our region’s only Kiwanis club. If you plan to attend, please RSVP by noon on March 3 to Faye Sargent at fayesargent1@nullgmail.com or to Karen Dudra at kdudra@nullcomcast.net. Since its founding in 1991, the Kiwanis Club of Peterborough has given more than $100,000 to regional children’s causes and scholarships. Kiwanis is an international service organization whose members stage nearly 150,000 service projects and raise nearly $100 million every year for communities, families and projects. After several years of dreaming, planning, fundraising, and hard work, the new Dublin Community Center is nearly completed. As this is being written, the ‘punch list’ contains the following items: the flooring, installation of kitchen and bathroom cabinets and appliances, lighting fixtures, trim work and finish painting. These should all be finished early in March. The Board is planning to invite the Town to a Grand Opening, which will be announced as soon as we are sure of the completion date, and will likely entail food prepared in our brand new kitchen. The Board has begun planning social and cultural activities for the Center, including senior yoga classes that will begin soon after opening. The facility will also be available for rent for private functions. Anyone interested in hosting groups, functions, or activities should contact us about scheduling. At the same time, extensive work is taking place upstairs where the old living quarters were taken down to the studs, reinsulated, rewired, and replumbed to become two brand-new apartments, the income from which will help support the Center. The apartments should be complete around the same time as the downstairs. Thanks to everyone who has supported this project. We are still raising funds to finish the work, buy furnishings, equipment, etc. Any donations would be greatly appreciated. Watch for the signs announcing our opening. We hope to see you there soon! Bruce Simpson is President of the Board of the Dublin Community Center. Members of that board include Jerry Branch, Nancy Cayford, Edie Clark, Vira Elder, Nancy Jackson, Susan Peters, Bruce Simpson, and David Wolpe. What is it about wheels that is so interesting to boys, whether 5 or 50? Could it have to do with getting someplace faster than by foot? While retaining some control over where you’re going? Whatever it is, I’ve been hooked since childhood. First there was my tricycle, then my scooter, then my roller skates, then my bicycles, and — finally — my automobiles. Peter Hewitt sent this article to the Advocate prior to his recent passing. Dog licenses are due by April 30th each year. This year we have little purple bell shapes to decorate your best friend’s collar. Please call or stop by the Town Clerk’s office for more information, 563-8859. “Be Part of the Magic” was the slogan for the Monadnock United Way campaign in 2013-14, and it was magical. So far, we have raised in excess of $1,938,000 (85% of our goal of $2,270,399). Here in Dublin, we raised $6,999 (93% of our goal) thanks to the team efforts of Judy Knapp, Margaret Flick, Nancy Jackson, and Margaret Gurney. Like the previous two, it was another economically difficult year. So kudos and appreciation to all of those businesses in town that supported the campaign, listed alphabetically: Dave’s Chassis and Body Work, Dublin School, Farmer John’s Plot, Francis McKenna Woodworking, Gammy Bird Consulting, Harvest Thyme Herbs, Hedge House, MEI Search Consultants, Moose Maple Nursery, Route 137 Auto Repair, She’s So Fine Hair Design, Simpson Landscape Co., The Friendly Farm, Windmill Hill Cabinets and Design, Window Master and Yankee Publishing. Special thanks and appreciation go to the employees, our friends and neighbors at Yankee Publishing, for their support and generosity, and for their company match. As part of the magic, the residents of Dublin used the MUW funded agency programs 302 times in 2012. (We do not have the 2013 information yet.) Some of the agencies include the Monadnock Family Services (MFS), Home Healthcare Hospice and Community Services (HCS), Big Brothers /Big Sisters of Western NH, Monadnock Worksource and MAPS Consulting Services. It never ceases to amaze us that the money donated to the Monadnock United Way does come back to the residents of the town(s), our neighbors, our friends and our families. That is why the campaign is so important for the Monadnock Region — and Dublin. Thank you everyone! For more information about the Monadnock United Way, its services or agencies, please visit www.MUW.org. Barbara Summers served as Division Chair for Towns III (Jaffrey, Rindge, Dublin, New Ipswich, Mason, Greenville, Temple). She was Dublin’s Team Captain. The Monadnock Rotary Club invites you to its weekly breakfast meetings, open to the public, at 7:30 am most Tuesday mornings at the Dublin Community Church, on Rt. 101 (Main Street). Guests are invited to attend free of charge, mingle with Rotarian members, eat a delicious breakfast made by the Dublin General Store, and enjoy one of the presentations below. On March 4, Hunt Smith, a Nelson-based violin maker and performer, will present “The Violin Story.” He brings more than 40 years of experience in the fine, decorative, and performing arts. He is a respected maritime artist, and has done restoration work for major museums and collections. As a skilled fiddler, his playing reflects traditional styles from Appalachia to New England and beyond, while retaining a classical tone. On March 18, 2014, Dr. Tammy Lenski will speak on “7 Common Negotiation and Conflict Resolution Myths Exposed.” Come learn some of the most common myths and how to avoid them at the negotiating table. For more than 15 years, Dr. Lenski has ignited radical problem-solving shifts, inspired individuals to fine-tune their persuasive voice, and untangled complex states of group and interpersonal conflict. The Dublin Recreation Committee’s annual WinterFest celebration was held on Saturday, February 8th, at Dublin Consolidated School. 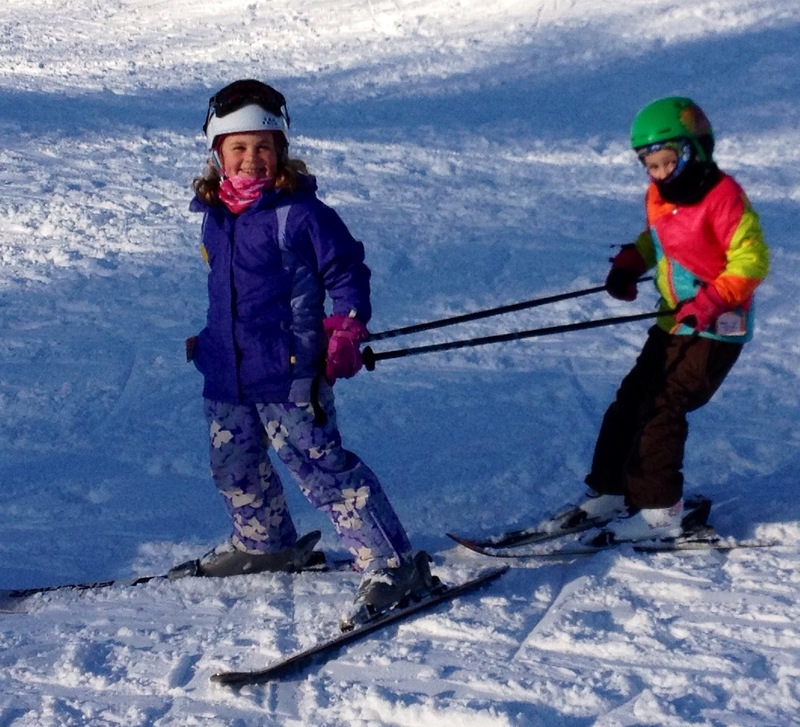 It was a perfect day with lots of sunshine and snow! Everyone enjoyed hot dogs, chili, cocoa, coffee, music and the warmth of the bonfire. The Monadnock Trail Breakers Snowmobile Club once again provided free snowmobile tow rides, always a crowd pleaser. Riders got the unique opportunity to take a beautiful cruise through the woods. Thank you Trail Breakers. Jason Bergeron (age 10 from Dublin) on his X-Fire 800 Snowmobile Box Sled. Next to Jason is his sister Amanda’s box sled. Congratulations to all racers and their “pushers” for a great job! 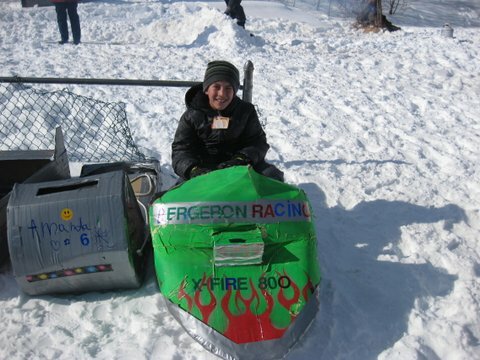 Each year we are impressed with the amazing designs and originality of the box sleds! Thank you to everyone who helped make WinterFest 2014 possible. We’d especially like to thank John Albano for providing the sound system and music, Chrissy Kastner for assisting in the kitchen, the DCS staff, and the volunteers from Dublin School. We couldn’t have done it without all of you! The Dublin Recreation Committee consists of Vira Elder, Chair; Dan Albert, Jen Bergeron, Kelly Blanchette, Mike Caron, Ken McAleer, Becky Stapleton, and Winnie Sundstrom. Monadnock at Home, a nonprofit 501(c)(3) membership organization giving folks age 62 and over the practical means and the confidence to live their lives to the fullest while remaining in their own homes, is holding an informational session in Dublin on Wednesday, March 12, from 10 am to 11:30 am at the Town Library. If you or a loved one is interested in learning how Monadnock at Home provides independence, peace of mind, social and community opportunities, and more for our members, join us. Coffee and refreshments will be served. Please call Sandra Faber at 371-0809 for more information, or visit www.monadnockathome.org. Hospice at HCS will offer “Grieving… After the Loss of a Parent,” a bereavement support group in Keene starting on March 20 and continuing on Thursdays from 5 pm to 6:30 pm through April 24. This group is open to anyone who has recently lost a parent. Come talk with others, find support, and share your own experience and wisdom. The group will meet at HCS, 312 Marlboro Street, in Keene. There is no charge to participate, but registration is necessary. Call Lynn Anne Palmer at 352-2253 for more information or to register. Hospice at HCS is a comprehensive nonprofit hospice program, providing end of life care to patients and support to family members. Care is offered in the home, in assisted living facilities or in nursing homes throughout southwestern New Hampshire. The Healing Arts Gallery at Monadnock Community Hospital is pleased to invite the public to the opening of Awakening, an art show that runs from February 27 through May 29. Featured artists include Joan Barrows, Lulu Fichter, Gail Hoar, Eva-Lynn Loy, Kimberly Peck, and Bettina Peabody. The MCH Healing Arts Gallery is adjacent to the Sarah Hogate Bacon Emergency Department. For more information, please visit www.mchhealingarts.com or call LeeAnn Clark at 924-1700. NH Audubon is celebrating its 100th year of keeping conservation in our hearts and minds. Since 1914, New Hampshire Audubon’s mission is to protect New Hampshire’s natural environment for wildlife and for people. It is an independent statewide membership organization with four nature centers throughout the state. Expert educators give programs to children, families, and adults at centers and in schools. Staff biologists and volunteers conduct bird conservation efforts. New Hampshire Audubon protects thousands of acres of wildlife habitat and is a voice for sound public policy on environmental issues. For information on New Hampshire Audubon, including membership, volunteering, programs, sanctuaries, and publications, call 224-9909, or visit www.nhaudubon.org. Or learn more about upcoming centennial events planned throughout the year at www.nhaudubon.org/about/centennial. We need to clean up transportation. A new report from the Natural Resources Defense Council (NRDC) and regional partners New Hampshire Audubon, the Appalachian Mountain Club, and the National Wildlife Federation, indicates that Granite State motorists could soon be filling their tanks with gas increasingly derived from dirty Canadian tar sands oil. While the concerns raised by New Hampshire citizens may help forestall tar sands crude from flowing through the state via a reversed Portland-Montreal pipeline, we could nonetheless suffer a backdoor inflow of tar sands oil — as refined fuels. A flood of dirty fuel into New Hampshire would undercut the state’s prior efforts to reduce carbon pollution. If the controversial Keystone XL pipeline for tar sands oil from Canada to the U.S. is approved by President Obama, the region’s share of gasoline from tar-sands crude could rise even further, according to the report. New Hampshire is a party to the Regional Greenhouse Gas Initiative (RGGI) to cut dangerous carbon pollution, the major driver of climate change. As of 2012, more than 800 megawatts of electricity is being generated in New Hampshire already by renewable projects, enough to power more than 133,000 homes. Towns across New Hampshire have been working hard to save money and cut carbon, including Temple, NH, which increased the efficiency of its town hall and fire department and cut their energy use by more than 80%. These important advances would be for naught if the state starts using gasoline from tar sands, which emits 17% more carbon pollution than conventional gasoline measured on a life-cycle basis. The report points out that state leaders, with the support of citizens and local communities, need to take steps to clean up transportation. The report also underscores the importance of promoting a wide variety of low-carbon and no-carbon transportation alternatives, from cleaner fuels to buses and rail, bike lanes and pedestrian-friendly planning.